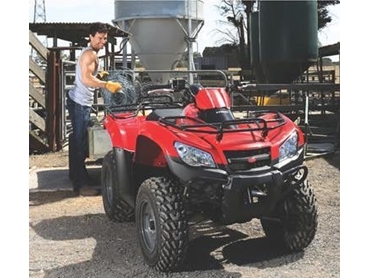 The Kymco MXU 400 is an ATV specifically designed for the needs of Australian farmers, which not only oozes quality, but is also an extremely practical tool for handling any tough work situation. The MXU 400 ATV has a 4-stroke air cooled engine that produces 26 horsepower, giving it the power to tackle even the toughest terrain. Its ‘shift-on-the-fly’ 2WD or 4WD traction, high and low range with 4-wheeled engine braking also means it offers a smooth and safe ride. Disc brakes at the front and rear make for reliable handling and stopping, while the MXU 400 ATV's Independent Rear Suspension adds to the comfortability of the Kymco ride. The MXU 400 ATV also boasts both air and oil cooling to easily handle the Australian sun and extreme temperatures. Kymco also understands that carrying and towing capacities are vital to farmers, which is why the MXU 400 ATV features heavy duty 34kg capacity front and 68kg rear racks, and a 447kg towing capacity. The large 15 litre fuel tank also means the MXU 400 ATV can run much longer and take passengers further. With simple, quality designs, Kymco ATV's are easy to maintain at a low cost, and they are backed by a two year factory warranty. Would any of the quads be suitable for moving and positioning of a 2 wheel trailer, 4.2 meter aluminium boat and 20 foot double axle 2 tonne caravan on level concrete in and out of a storage warehouse?